craftsmanship. She has studied under renowned mosaic artists, including Laurel True and Isaiah Zagar. Nancy is a Carmel Arts & Design Artisan, Indiana Glass Trail artist and a member of the Society of American Mosaic Artists. Her works can be found at ArtSplash Gallery in the Carmel Arts and Design District, area juried art shows and on her website, Mosaics Garden. 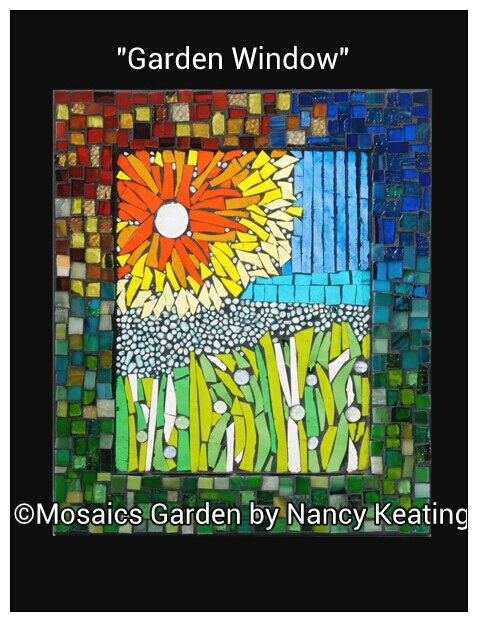 “I used No Days Mosaic Adhesive film for my piece, Garden Window. It was the first time using (No Days Instructor) Carrie’s advice of prepping glass first by pre-melting the film. PreviousPrevious post:Creating 3 Dimensional Mosaics with No Days Mosaic AdhesiveNextNext post:Win one of 3 No Days Prize Packs!